Herodotus locates the Sauromatai to the east of the Scythians - the boundary being the river Tanais (Don). "They inhabit a territory beginning from the northern tip of Lake Maiotis (Sea of Azov), and extending fifteen days' journey towards the north. All this land is bare of trees." 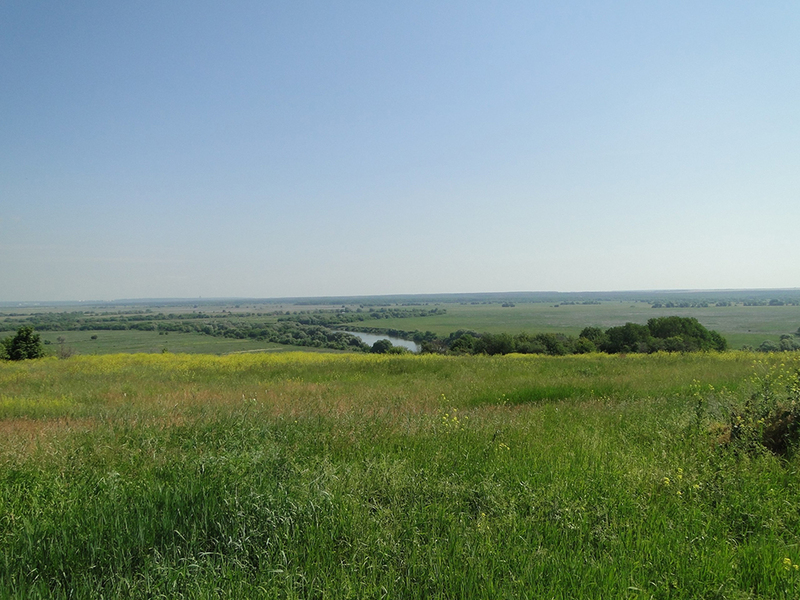 The "Grass Sea" where the Sarmatians lived. It stretched from the Sea of Azov to the Altai mountains. According to Herodotus, they originated from young Scythian men mating with Amazons - he has a romantic story of how this came about! There were female warriors among the Sauromatai, just as Herodotus says - attested by weapons found in female graves. The Sauromatai allied with the Scythians to oppose Darius' attempt at conquest. From around 250 BC, The Sarmatians, over the next centuries, began moving west and almost completely displaced the Scythians, eventually ruling a vast area from the Don to the Danube. This movement could well have been a consequence of Alexander's conquests in Central Asia. Another factor was the Sarmatians' superior weaponry: their warriors had longer swords and spears, and were protected by body armour. Their cavalry's shock tactics would have been comparable with that of the Parthians. They adopted and adapted much of Scythian culture, though. Sarmatian barrows contain gold objects with animal imagery very similar to that of the Scythians. There were two main branches of the Sarmatians, the Roxolani and the Iazyges. The Iazyges, moving further west from the Danube estuary (where Ovid mentions them) threatened Dacia and Pannonia. After military setbacks, they became clients of the Romans under Trajan - though later they allied with the German Marcomanni against Rome. A contingent of 5000 cavalrymen of the Iazyges was sent to Britain by Marcus Aurelius to guard Hadrian's Wall (after AD 175). The Roxolani, defeated by Rome also became clients, but later joined the Goths in their raids into the empire. The Sarmatian dominance was progressively eroded by encroaching Germanic tribes. Some were settled in the Roman empire, some were absorbed by their German neighbours, some were pushed back into the Caucasus. Their territory was inherited by the Huns in the 4th century AD. Sarmatia(in Polish,Sarmacja) was a name for Poland?that was fashionable into the 18th century. The Polish nobility affected to believe in their descent from the Iranian nation that had occupied parts of eastern Europe in ancient times - a belief that also influenced the aristocracy in other Slavic states: perhaps the derivation of "slave" from Slav encouraged them to look for a more appealing genealogy. Also known as Sauromatians, and like their Scythian neighbours, Iranian-speaking. Original homeland was east of the Don; they moved westward to replace the Scythians from the 3rd century BC, and later moved further into Europe, where they encountered the Romans. 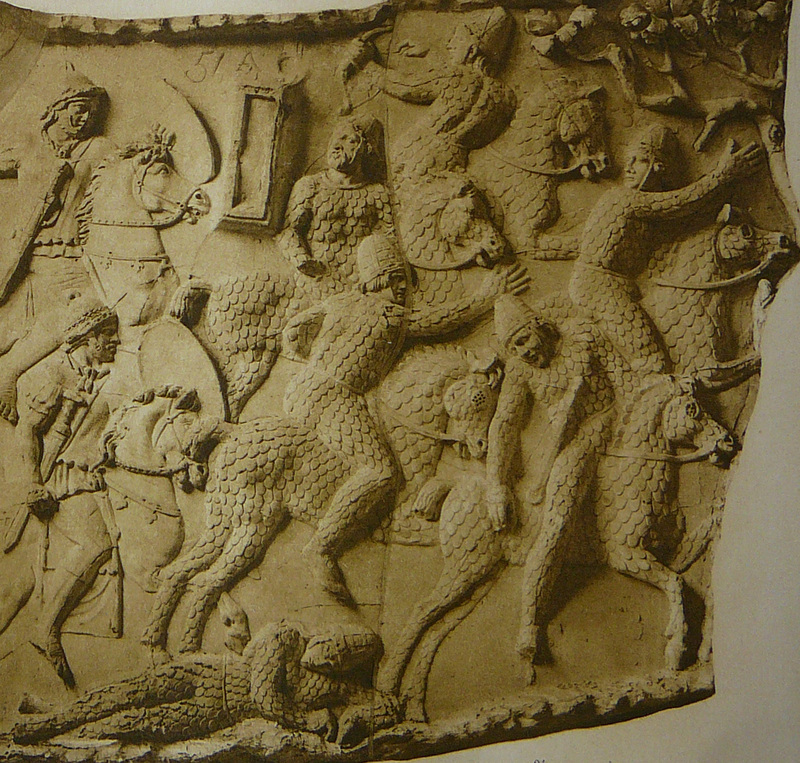 The Scythians and later Alans had a sword-worshipping cult. The Ossetians, descendants of the Alans in the Caucasus (the only Alans to save themselves from cultural annihilation by the Goths) venerated a young warrior who pulled his sword out of the ground, and when old and fatally wounded threw it into the sea. Could the Sarmatians have inspired the Excalibur myth?